When you present in front of an audience, you're competing for attention. There's a high-definition screen in the pocket, purse or palm of almost every attendee. How many will resist looking at it at some point during your presentation? It might depend entirely on how much you can keep their eyes on you. Turn -Can you see that? into -Did you see that! 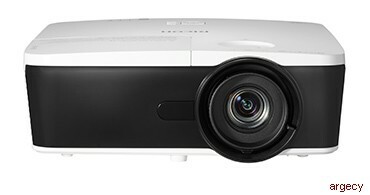 with the PJ WU5570 projector. Project brilliant, lifelike reproductions in high definition on almost any surface up to 300" diagonally to captivate audiences in mid-size conference centers, classrooms and auditoriums. Every detail of every image, schematic, movie and other visual can be seen clearly in 1920 x 1200 WUXGA native resolution to keep participants paying attention to your message. Don't let your presentation be washed out by forces you can't control. Keep colors bright and details sharp with 5,500 lumens even when presenting in sun-drenched rooms or other venues. The 9,000:1 contrast ratio adds more definition between light and dark colors, so everything from the first scene of an action-packed movie to the last number on a financial spreadsheet can be viewed with equal clarity. Make sure your message stays clear at all times. The system does most of the work for you, including automatically balancing itself and adjusting projected colors to complement the backdrop. But you can use Keystone Correction Image Adjustment to fine-tune the presentation when necessary with the easy-to-use remote control. Choose from multiple HDMI, USB and other connection ports to plug in almost any device and change how you display your information on the big screen. It's easy to make adjustments in moments. In fact, you can have your administrator do it for you from a remote location with optional management software. Stay focused on your presentation, not logistics. The PJ WU5570 can be mounted, so you won't have to worry about tracking it down and setting it up moments before your audience arrives. It starts within seconds and shuts down quietly so all eyes remain on you and your presentation. *Lamps are consumable products and therefore are not covered by the projector's warranty. The Ricoh PJ WU5570 is under warranty against defects for a period of three years from the date of purchase. Consumables are under warranty for a period of 90 days from the date of purchase or until depleted, whichever comes first. Please refer to warranty documents shipped with the product for more details.